In this absorbing coming of age story, you will learn along the way something about why this country has had a vested interest in deifying the memory of Martin Luther King, Jr. and in vilifying the reputation of his more activist rivals for power in the black community. 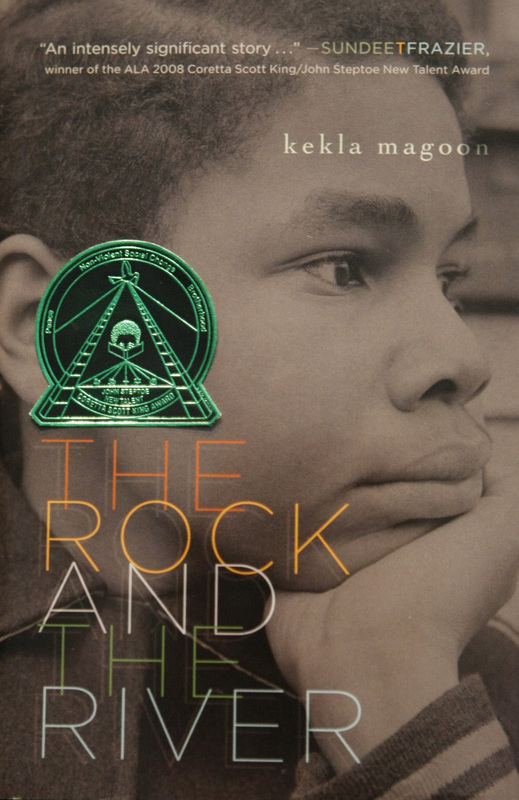 In Magoon’s story set in Chicago in 1968, thirteen-year-old Sam and his seventeen-year old brother “Stick” are compelled to confront the difference between these two philosophies of the black civil rights movement, and to make a choice. Their father, Roland Childs, is a well-known (fictional) colleague of Dr. King’s and an important figure in his own right in the non-violence movement. But the impatience and optimism of youth are powerful catalysts. Stick begins to sneak out of the house to attend meetings of the Black Panthers, in direct violation of their father’s wishes. “‘Well, you can’t be the rock and the river, Sam. Nevertheless, the story ends with guns and ends tragically, as it unfortunately did with dismaying frequency back in those years. And because I am part of a family with educators, I hear – also with dismaying frequency – “why teach that history to today’s blacks? It will only stir them up and make them angry.” And so it is not often taught. And the memory of Martin Luther King, Jr.’s call for nonviolence is hyped and praised and honored with a special holiday. The author states in an interview she gave to Zetta Elliott that she wanted to write this book because in school she only learned about the champions of non-violent protest. She never heard about all the social programs of the Black Panthers, nor about the effect that the threat of more direct action had on the government’s desire to appease Dr. King and elevate his reputation to the detriment of his rivals. With this book, she aims to contribute to a more balanced presentation of the history of the movement. Evaluation: This book won the American Library Association’s Coretta Scott King/John Steptoe Award for New Talent, was nominated for an NAACP Image Award, and has been named a 2010 ALA Notable Book for Children and a YALSA 2010 Best Books for Young Adults. It is an excellent way to find out more about relatively recent American history in a gripping format that provides a fair look at both sides of the question of civil rights strategy. I believe it is a must-read for those born after the events described in this book.